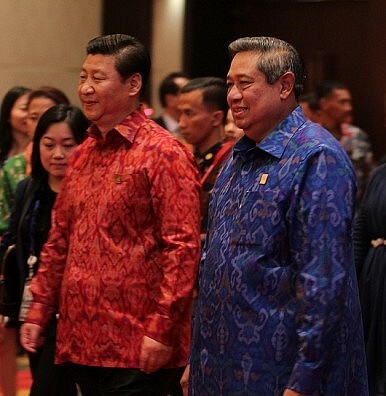 Xi Jinping seems determined to build a “community of common destiny” in the Asia-Pacific. So what does that mean? Ever since his refreshing public speech in front of international media in late 2012, Chinese President Xi Jinping has been either creating or stressing quite a number of catchphrases. These phrases help showcase his ideas about how to lead China forward. Xi’s catchphrases or keywords include the China dream, new type of great power relations, and a community of common destiny. In 2007, the phrase “community of common destiny” was officially adopted in Hu Jintao’s 17th National Party Congress report to describe the special cross-strait relationship between mainland China and Taiwan. Ever since, Beijing has been keen to use this term to emphasize its important but unique relations with other countries, particularly China’s neighbors. Such comments may be found in Hu Jintao’s June 2012 speech during the summit of the Shanghai Cooperation Organization, the 18th National Party Congress report made by Hu Jintao in late 2012, Xi Jinping’s speech during his visit to Africa in March 2013, Xi’s speech at the Boao Forum in early 2013, and during Xi’s recent visit to ASEAN countries. In the Conference on the Diplomatic Work with Neighboring Countries on October 25, 2013 in Beijing, Xi Jinping particularly stressed “letting the awareness of community of common destiny take root in the neighboring countries.” This was understood as a guiding principle of China’s diplomacy with its neighbors. The concept of a community of common destiny is the core part of a well-designed and carefully constructed new diplomatic strategy for Xi’s era: there is the “China dream” to maintain domestic unity and stability, “new type of great power relations” to find alternative ways of peaceful co-existence with major powers, and the “community of common destiny” to ensure a peaceful and stable neighboring environment, which is essential for China’s continued rise. The timing of Xi’s new emphasis on the phrase is interesting — China’s promise of a “community of common destiny” can be regarded as a counter-balancing measure to Washington’s “return to Asia” policy. Beijing takes a slightly different approach that can be described as “strong and powerful but not tough” (in Chinese: 强势但不强硬). This confidence comes from the fact that China is now the world’s second largest economy and is still rising while the incumbent dominant power, the U.S., is in relative decline. Of course, as currently its military growth is understandably causing worries in the region, Beijing also intends to show its neighbors a softer image by emphasizing community and a shared fate. The idea of a community of common destiny also indicates that Beijing has decided to take a leadership role in transforming the multilateral trade system. Recent trade negotiations such as the Trans-Pacific Partnership (TPP) and the Trans-Atlantic Trade and Investment Partnership (T-TIP) show that the West and the U.S. are trying to replace the decades-old multilateral system with a smaller version, which Philip Stephens of the Financial Times described as “midi-lateralism.” Interestingly, the world’s second largest economy has been left out of the TPP and T-TIP talks, despite the fact that China has been the biggest winner in the current multilateral trade system. Moving forward, Beijing may use the idea of a community of common destiny as part of its ambition to ensure that China remains a leader in the multilateral system. China could essentially form a bloc with those countries that more or less depend on its economy. However, Beijing has yet to be genuinely consistent about what its community of common destiny actually means for its neighbors, much less the other regional major or great powers. As a fairly comprehensive political or diplomatic proposition , the concept needs further definition. A similar term would be “community of fate or destiny,” which Ingo W. Schroder describes as countries that “share a common history and have been exposed to the same process of socioeconomic structuring.” Given the extremely complicated historical, cultural, and political diversities throughout the region, China seems to have no choice but to link its initiative to common challenges such as climate change, sustainable development, and anti-terrorism, instead of relying on a common history and similar processes of socioeconomic structuring, much less shared identity, to create a sense of community. Some may question how far such a community can move forward without substantially shared norms and institutions. Beijing seems to have already acknowledged the obstacles and has been more actively involved in various regional and international rule-making processes. But there is still a long way to go. Further, as a great power, it is relatively easy for China to “give” but not always comfortable for those smaller neighbors to “accept.” Take South Korea as an example. Seoul’s economic fate has become increasingly dependent on China’s huge market, while its security so far still depends on the Seoul-Washington alliance. Should China intend to further push forward its initiative of creating a community of common destiny, Beijing will have to carefully calculate the subtle, delicate, and even hidden reactions from all China’s neighbors.